It has been a while since I’ve shared a completed project from my bench. I haven’t been particularly inactive, just an inactive blogger. 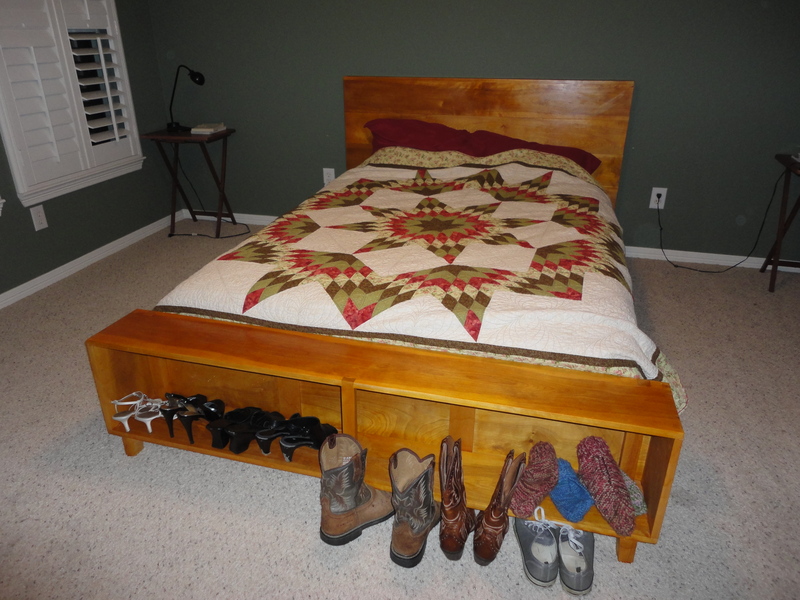 Recently, I completed a queen-sized platform bed for my wife and I. I completed the footboard over last winter break, and this summer I took on the headboard. The headboard and rails are put together with pocket hole joinery. The headboard, made out of solid birch and poplar, is way too heavy for the light rails. Instead of raising the height of the bed and creating thicker rails, I used a french cleat in my wall to hang the headboard. The bed is rock solid now. Finished with amber shellac and wax. Check out the Sketch-Up drawing for more info. At it’s simplest, this is the Bed Frame Project with a headboard and footboard attached to either end. Click on the link to get the plans. You can check out the Sketch Up drawing in the 3D Warehouse. Make it safe & keep the rubber side down. Thank you for your support of WoodshopCowboy. This blog is a labor of love, and liking WoodshopCowboy on Facebook, following me on Twitter or adding your name to email list keeps me invigorated and writing.